The sunlit shallows along a shoreline — lush with aquatic vegetation — constitute the littoral zone. Here, muskrats breed amid cattails. Red-spotted newts lay eggs on underwater plants. Smallmouth bass build nests in the cover of submerged branches and logs. Insects and algae living in these logs become food for water-dwelling creatures. Dabbling ducks nest amid bulrushes and sedges and feed on aquatic seeds and tubers. We have “cleaned up” littoral zones by dredging shorelines, using herbicides to control vegetation, and constructing docks, retaining walls, and beaches. The shoreline web of life and water quality have suffered. But we can repair this damage. 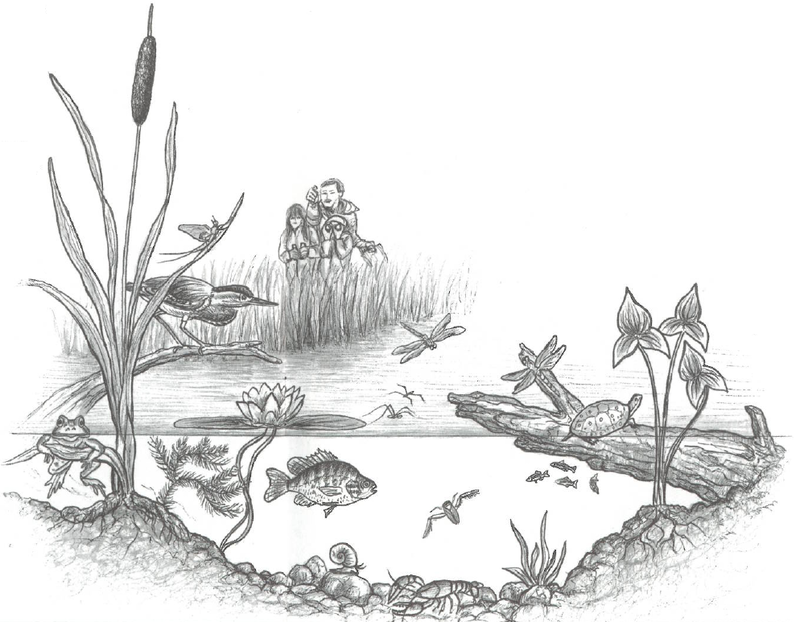 Grow native aquatic plants by sowing seeds or transplanting vegetation from a donor site. In late summer or early autumn, collect ripe seeds and flowers from many plants over a large area, taking no more than 10 percent of a crop. Dry flowers for a day or two by spreading them out on newspapers. Then separate seeds from floral parts. Place cleaned seeds in sealable containers that will keep them moist. Store in a refrigerator at about 3 °C for several months. Choose a planting location with soil and water conditions similar to those of the harvest site. In early summer, after water levels have fallen, sow seeds onto the soil of a littoral zone. Cover cattail, arrowhead, sedge, blue flag, swamp milkweed, and water plantain seeds with a thin layer of soil. Bulrush, alder, and water willow seeds need only be sown on the surface. Collect small portions of common plants from sites with conditions similar to your own. Use a shovel to remove plants in clumps with a few stems and soil surrounding their roots. Do not uproot entire bunches. Keep plants damp in a bucket and transplant them to the new site as soon as possible. Dig holes with a shovel or by pounding a stake into sediment. Push roots about 5 cm below the surface, firmly packing soil around them. Roots must be securely anchored. If necessary, hold each clump down with a forked dead branch. Logs, stumps, and driftwood within the littoral zone are critical elements of aquatic habitat. Anchor large woody deadfall along edges of fast-moving streams to help stabilize channels and banks or in slow-moving areas like ox bows to create pools and shelter for fish. Secure fallen logs on edges of ponds and wetlands so they are partly submerged. Turtles and water snakes use them as basking sites. Leave branches, twigs, and fallen tree limbs in shallow water, where small fish can find nooks in which to hide.